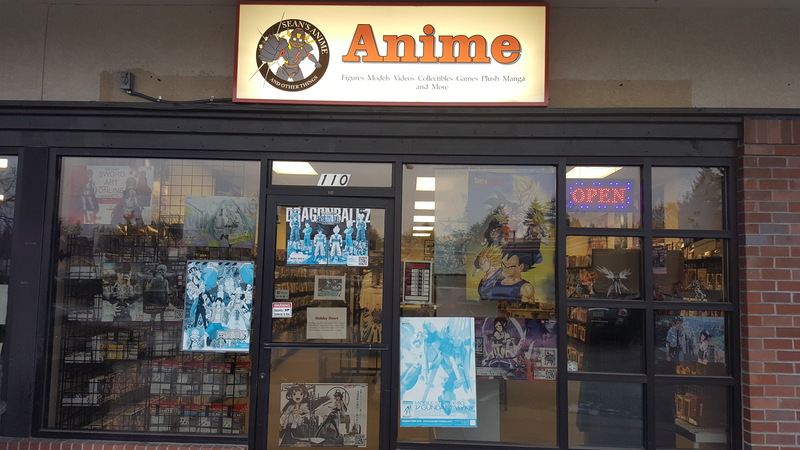 Formed by Sean Kemp, a long time anime fan in Tacoma, WA, Sean's Anime & Other Things helps anime fans find the merchandise they are interested in. We carry a large variety of anime goods, including model kits, figures, wallscrolls, keychains, lanyards, plushies, dvds/blurays, and manga. Come see our wall of model kits! There's more than just Gundams available. We also have kits from Star Wars, Dragon Ball Z, Code Geass, One Piece, and Love Live. We carry some video game goods as well and have items from Nintendo and Square-Enix. On top of all that, we also carry some card and board games such as Magic the Gathering, Pokemon, Yu-Gi-Oh, and Tanto Cuore. We also have a few tables for use in community activities. Come on over and join us for Monday Night Model Building from 4-8pm (we provide some tools/instruction if you're just starting out. ), or Friday Night Video Games (a fun crowd starts up around 6pm and stays till around midnight), or any day of the week to join us in watching anime on our 50" TV or just to hang out and use the tables to play games. We're open seven days a week, except for Thanksgiving, Christmas, and Sakura-con.